The middle adjective is an attack on the European Commission and the International Monetary Fund; the last adjective is an attack on Germany. The conditional clause is a call to the Cyprus Parliament to reject the terms. Almost an hour later, at 13:23, the state news agency RIA-Novosti issued a fresh version of what the Kremlin wants to say. In the new bulletin it is the presidential spokesman, Dmitry Peskov, who carries the water. According to Peskov, “at the meeting the Head of State reiterated his thesis, described earlier in address to the Federal Assembly, that Russia is interested in de-offshorization of the economy, that economic conditions should be totally transparent and clear, so no one could use [offshore banks] for tax evasion and concealment of their income. In this context, evaluating the possible decision to impose an additional tax in Cyprus on bank deposits, Putin said that such a decision, if adopted, would be unfair, unprofessional and dangerous”. Exactly what decision the President has now made is not yet known. It is clear — click here — that for about a month a half Putin had accepted the advice of his officials to reject the Cyprus application for a second €5 billion loan. So was Putin taken by surprise when the Germans came up with the alternative of taking the €5 billion instead from Russian depositors in Cyprus’s banks, especially the big Russian corporations? Peskov was asked to clarify the position. 1. Is Mr Putin going to meet Cyprus Finance Minister Sarris on Wednesday in Moscow? 2. Is he intending to speak by telephone with Cyprus President Anastasiades as Mr Putin had spoken to his predecessor President Christofias on January 29? 3. 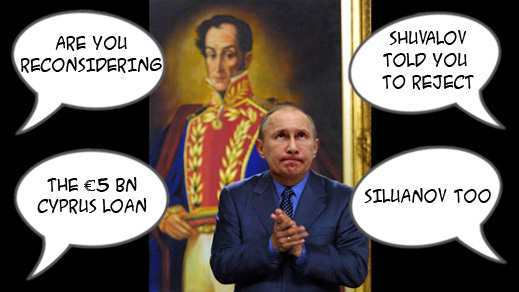 Is Mr Putin reconsidering the Cyprus application for a second Russian loan of €5 billion, previously rejected by Mr Shuvalov and Mr Siluanov? That was 30 minutes ago.